Can be applied to both asphalt and concrete. Solid stone or patterns available. Fast Installation with little project downtime. Handles northern climate freeze thaw cycles. Tested and meets DOT friction requirements. Repairs are easy, with invisible seams. UV stable stone that will maintain its color for years. Natural marble and granite stone chips are available. The “FrictionPaveTM Surfacing System” consists of a specially formulated two-part binder which is topped with a pigmented or natural stone. 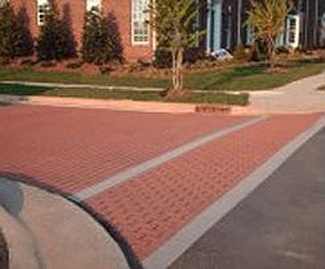 Skid resistant and durable surfaces are provided using the FrictionPave Surfacing System on both Asphalt and Concrete. 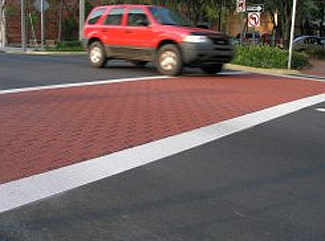 FrictionPaveTM (HFST) can be applied onto existing asphalt and concrete… or on newly placed, cured surfaces.